Ancient Egyptian Ruins in… Guadalupe? There are few tales in fiction more epic than the search for a lost city. There is a fascination with traveling off to faraway lands, braving the elements and dangerous critters to find the ruins of a civilization long gone. While this ideal is rooted in the archaeology of the 19th century, it has been romanticized in modern fiction. But sometimes the ruins aren’t so far away. Sometimes the ancient ruins come to you. And they might not be so ancient to begin with. 1923 saw the release of Cecil B DeMille’s silent epic “The Ten Commandments”. It was the grandest show audiences had ever seen and was produced on a scale unthinkable at the time. It featured one of the largest movie sets ever built at 120 feet tall and 720 feet wide. It took 1500 workers, 500,000 feet of lumber and 12.5 tons of nails to build and featured 500 tons of statuary (including 21 sphinxes). There were a staggering 3500 actors on the site as well as 5000 animals along with 125 cooks. DeMille had truly built a city, a production that perhaps has never been matched since. But where did he build such a set? And what became of it? 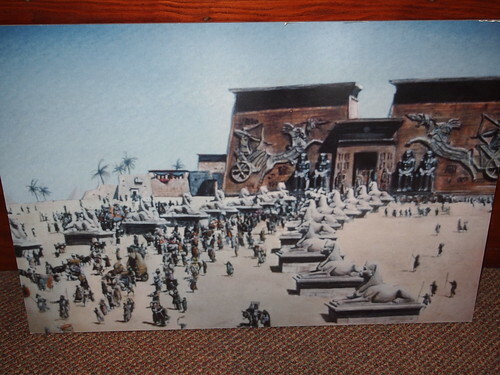 A picture of DeMille's "City of the Pharoahs"
Being set in Egypt, he needs a place that looked like a desert. After looking around, he found the immense, rolling dunes near Guadalupe, California to be an excellent match. But once production was completed, what was he to do with his gargantuan set piece? He couldn’t leave it standing: if he did, other film companies would move in like hermit crabs and make cheep knock offs of his masterpiece. It was too big to take away piecemeal. 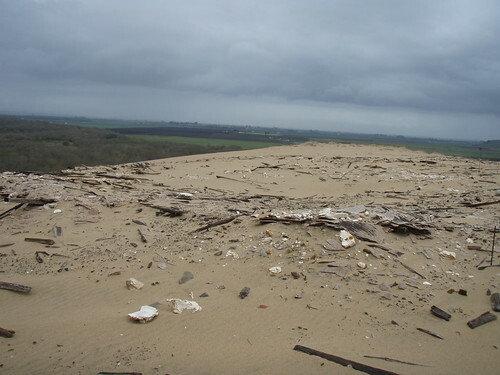 So he had workers secretly use dynamite to bury the set beneath the sands of the Guadalupe dunes. And nobody would know where it went for decades to come. In the 1980’s film buffs followed a vague hint in DeMille’s autobiography in an effort to locate the legendary film set. They made their way to the Guadalupe dunes to find DeMille’s “Lost City”. And sure enough, they did. Lucky for them, though, that the dunes are never static. Wind is constantly reshaping the dunes, moving sand around, laying it down and blowing it away. This constant movement had exposed the set’s location. Considering its age and importance, the set became a registered archaeological site. Excavations uncovered loads of artifacts, including pieces of the set’s massive façade. Today it is nothing but a debris field, strewn with small chunks of concrete and the odd bit of metal. 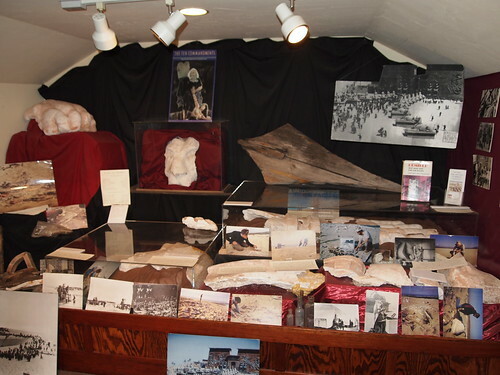 Many artifacts can be seen on display at the Dune Center in Guadalupe. They stand as a testament to the ambitions of a film maker from the glory days of Hollywood. The artifacts and the site they once occupied may have been crafted as movie props, but what they created was no less breathtaking and astonishing than the ancient ruins that inspired them. Last time I gave a little background info on what I call the “Forgotten Dinosaurs of the ‘Lost Continent’”. This time we’ll look at the dinosaurs themselves. But first I don’t feel like I was clear enough in my reasoning in the last post. Why have I bestowed these animals with the title of “forgotten”? Well even though the West Coast is a crappy place for dinosaur hunters, a few fossils beyond fragments have been found. I call them the “forgotten dinosaurs” because in discussions of Laramidia and dinosaur provincialism, they are almost never mentioned. So now I present you with the few, the proud: the dinosaurs of western Laramidia! Not too much to say here since I have already done a post about it. Nonetheless Aletopelta is unique in that it is the only genus endemic to western Laramidia (at least so far). All the other dinosaurs are known from elsewhere, whereas Aletopelta is a beast all its own. Like most other dinosaurs in this discussion, Lambeosaurus laticaudus is known from the El Gallo formation of Baja California. Also, this dinosaur is a member of a genus known from elsewhere. But this dinosaur really stands out from its kin to the northeast. For one, it’s huge, possibly the largest hadrosaur known; it has been estimated at 50 feet long and over 20 tons in weight. It also had a narrow tail, which the original describers interpreted as an adaptation to swimming. The disassociated remains of several individuals have been found, including juveniles, which suggests Baja may have been a breeding ground. A couple hadrosaur specimens have been found in San Diego County, but they are too fragmented to be assignable to any genus. While most of the Baja fossils have been referred to Lambeosaurus (indeed its own species of Lambeosaurus), there has been some doubt as to its exact identity. Some have suggested it might be a species of Hypacrosaurus. More recently, some think it may belong to Velafrons, a new hadrosaur known from eastern Mexico. However, without a crest, it may be difficult to determine just who Lambeosaurus laticaudus really was. 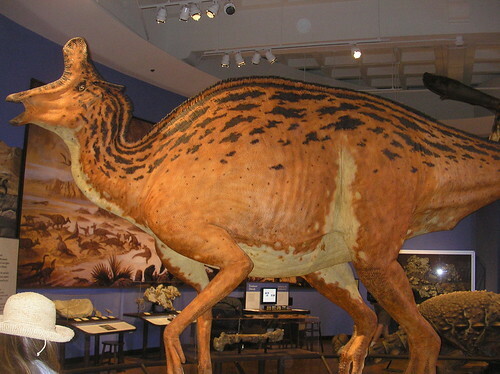 It is well known that Saurolophus has been found from Canada and Asia. What people don’t know is that it has been found on the west coast as well. 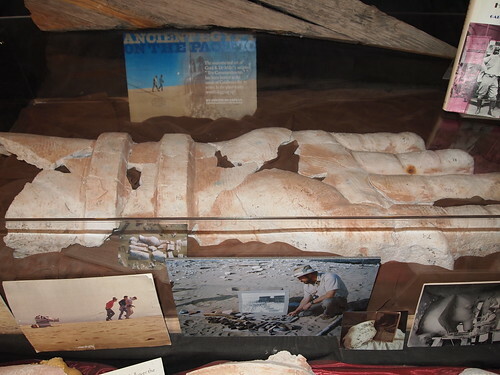 Way back yonder Chester Stock, one of the giants of California paleontology, discovered two skeletons of Saurolophus in the Panoche Hills of Fresno County. One, while fairly complete, was poorly preserved. The other was nearly complete and in good condition. While both lack the diagnostic crest and can’t be assigned to a specific species, they are the most complete dinosaurs found in either Alta or Baja California (or west of the Rockies for that matter)! The LA Museum plans to have a display about California dinosaurs in their new dinosaur hall. Looking at concept renderings it looks like one of these Saurolophus skeletons will make an appearance as well as what looks like a silhouette of Lambeosaurus laticaudus. A smaller earlier relative of Tyrannosaurus, Albertosaurus is known definitively from Alberta and Montana. It may also be known from Alaska, Texas, and Baja California. Some teeth thought to belong to albertosaurus have been found in the El Gallo formation. Whether it truly is Albertosaurus or something else all together is unknown. 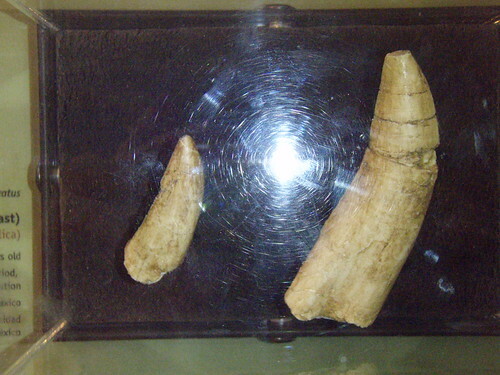 Unlike mammals, dinosaur teeth are not very diagnostic beyond the family level. So while Albertosaurus may have lived in California, we cannot say for sure. Again inferred from a couple of teeth in the Ell Gallo formation. Sauronitholestes was a dromeosaur about six feet long. 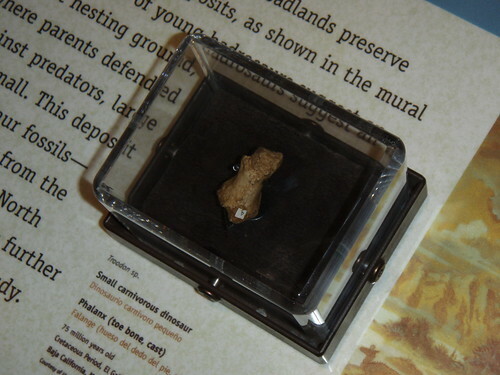 Inferred from a tooth and a toe bone from the El Gallo formation, Troodon is famous for its relatively large brain. An ornithomimid is known from the El Gallo as well as well as several indeterminate theropod teeth. Fragments of hadrosaurs are known from many places in California such as Orange and Tehama Counties. So far no ceratopsians are known from either Alta or Baja California. This is very interesting since ceratopsians show a high degree of provincialism in eastern Laramidia Perhaps the environment in western Laramidia wasn’t suitable for ceratopsians. Or maybe we just haven’t found them yet. I mentioned in my last post that the dinosaurs found in Alta and Baja California might throw a monkey wrench into the idea of dinosaur provincialism. Why? Well the idea stipulates that various dinosaur species are unique to their respective regions. Indeed this seems to hold true for the east of Laramidia. Pentaceratops is known only from New Mexico, Kosmoceratops is only known from Utah, and Chasmosaurus is only known from Alberta. The same goes for many other dinosaurs. But the dinosaurs of western Laramidia all seem to be dinosaurs found in Canada. According to dinosaur provincialism, they ought to be their own assemblage, because dinosaurs of the south haven’t been found in the north. See the problem? However, they may not be alone in this problem. Gryposaurus is known from Alberta but also from Utah. But maybe this isn’t such a problem since they are different species. But this still doesn’t wholly explain the dinosaurs of western Laramidia. How did genera found in the northeast somehow end up in the southwest when most other dinosaurs in the south consist of their own genera? Were they somehow able to circumvent the mountains from the north and settle into the west? Unfortunately, most of these apparently lost dinosaurs (save for Saurolophus) are represented by scrappy material. As noted Albertosaurus is inferred from just teeth! Those teeth could have belonged to an unknown theropod for all we know. While California has yielded few informative specimens, Baja California remains our best bet for finding the dinosaurs of Western Laramidia. Who knows what we may find in the El Gallo formation. It certainly shows promise. But what I have been able to read has not been encouraging. Apparently the terrain is very uneven and the climate harsh, making it difficult to look for fossils and even harder to extract them. Also, apparently Mexico doesn’t like outsiders snooping around. According to a book on California dinosaurs, the LA Museum was pressured to cough up many of its specimens from the El Gallo and return them to Mexico. Whether this holds true for today is unknown to me but if it does it must only be for dinosaur fossils since the LA museum still has tons of Pleistocene fossils from Mexico, which they continue to find. I’d love to try and search for the dinosaurs that called Baja California (and from extrapolation maybe Alta California as well) but right now it doesn’t look like it’s in the cards. Certainly more fossils would help solve the many questions we have about dinosaur provincialism. However, the threat of stirring political ire is a little too daunting for me. The Great Dinosaur Rush of the late 19th and early 20th century left few Mesozoic rocks unturned. Every now and then a new formation would be explored and new dinosaurs would be published. And just when it appeared that we had found all there was to be found, newly explored exposures in Utah began to capture the imagination with an explosion of new species. One of these exposures, the Kaiparowits formation, has gotten loads of media attention not just for its new species but also for its place in the big picture of dinosaur evolution. The Kaiparowits formation is about 75 to 72 million years old, which means it was from the time when North America was actually two continents cut in half by a shallow sea (which is why marine fossils are discovered in places like Kansas, Nebraska, and Alberta). The two continents have been dubbed Appalachia for the eastern half and Laramidia for the western half. Not much is known about Appalachia due to a poor fossil record. However Laramidia is much better known thanks to such well known deposits as the Dinosaur Park formation in Alberta and the Two Medicine and Judith River formations in Montana. For a long time this was all we knew of Laramidia, and since both regions harbored very similar dinosaur faunas, it was assumed that this must have been the fauna for the whole of the continent (especially since the same dinosaurs were being found in Alaska). But the last 10 or so years has seen this trend turned on its head. As scientists started probing deposits further south, like the Kaiparowits in Utah, the Kirtland formation in New Mexico, and the Aguja formation in Texas, a different picture emerged. While the north had a fairly uniform dinosaur fauna, different regions of the south had each had their own unique collection of species, with a few of the same species from the north. For example, in the north the tyrannosaurs were comprised of Albertosaurus and Daspletosaurus. But New Mexico had its own tyrannosaur, Bistahieverser, and Utah harbored an as yet unnamed species of tyrannosaur. This phenomenon has been dubbed “Dinosaur Provincialism” and has seen more and more support as more fossils are described. But this has all been going on in the east of Laramidia? What about the western half of the “Lost Continent”? Why have the dinosaurs of the west received so little attention in the discussion of Laramidia and dinosaur provincialism? The simple answer is: the west coast is a horrible place for dinosaurs. It’s a horrible pace for dinosaurs for the same reason as the Midwest. Like the Midwest, a lot of the west coast was covered by shallow sea, an environment dinosaurs did not inhabit. What is more, this shallow sea lapped at the base of a mountain range. While dinosaurs surely lived in said mountains, mountains are very bad environments for the preservation of fossils. As bones are washed down in mountain streams they get tossed around and destroyed so that by the time they reach a flood plain or the ocean there is almost nothing left to be preserved. But low and behold dinosaur fossils have been found on the west coast! They may be few and fragmentary but they are nonetheless dinosaur fossils! And they almost appear to throw a monkey wrench in the idea of dinosaur provincialism. Stay tuned for part 2 of “Forgotten Dinosaurs of the Lost Continent” where we’ll look at the beasts themselves!